These last day days of summer have been beautiful, sunny, hot, maybe a little too humid, but the way summer should be. Summer has its own unique light, the skies are a range of blues, the days are long and the nights begin with sunsets that vary in color and intensity. As the night falls, the sky can be filled with reds, pinks, purples and oranges. Artists have always drawn inspiration from the incredible light show from summer sunsets. Artworks, paintings or photographs, representational or abstract are a wonderful way to bring art into your home to evoke a time, a season, a place that is meaningful. Here are a few RE artworks that capture these radiant nights. “Great art picks up where nature ends.” - Marc Chagall Art is a visual creative expression of an artist’s moods, feelings, experiences. Interesting how so often it reflects the beauty of what they see and then capture around them. I often reference the influence of nature on the various work of many artists. These select artworks reflect a few artists’ interpretations of nature, their wintry blues and browns touched with gold accents - they feel like the holiday and winter season - filled with warmth, family, friends and some holiday sparkle! When I saw this photo recently of a jaguar in photographer Shelli Breidenbach’s home, I was drawn to the graphic and stunning image. Shelli captured the animal, its movement and its beauty. Aztec is from Breidenbach’s Big Game series. It made me think about how animal prints have been used in fashion and home decor for a long time, a bit of a zebra or leopard pattern make a strong visual statement. This began in the 18th century when Europeans brought back exotic skins as trophies while they were colonizing Africa and Asia. They remained a status symbol of sorts. The brown, black and white patterns, created from nature easily blend with all styles. I recently browsed through many Pinterest boards, here is one by interior designer Carolyn Williams filled with great pics from fashion and decor. This is a more serene image, of an abstract sunset from John Duckworth’s Landscape Series. Duckworth’s “photographs are infused with an intimate knowledge of nature, a passion for pure color, and a rhythm drawn from life itself.” His images of the South Carolina coast have a universal appeal. There has been much interest recently in abstract land and seascapes, as they bring nature inside in a way that is familiar, easy and calming. Kerri Rosenthal’s abstract paintings reflect the artist’s here and now, she is always adding new work to her different series. Kerri gives names to her work that lets the viewer into her world, one that’s informed by many stylistic viewpoints, from art, to fashion to decor to nature. A recent series is all about the season, Winter Chic, 40"x40"
The images are stunning when printed large and mounted in plexi as in a recent installation. In photographer Barbara Erdmann’s Abstract Series, she focuses on the repetitive patterns she finds in nature. This graphic image, Hubris, brings back memories of pulling dandelion weeds from the ground, making a wish, and blowing it through the summer air. Wishing you a happy, healthy holiday season filled with warmth & sparkle...and hoping your wishes for the season and the new year all come true! I met the owners, Bets Miller and Aly Drew that day. We immediately connected and I learned of their vision to provide "classic contemporary home furnishings, art, gifts and décor to the design trade and chic Westchester and Fairfield County shoppers". We began showcasing Romanoff Elements artists, there is terrific space in the 3000 square foot gallery-like shop to look at and consider artwork. The furnishings provide a real-life context to see the art & design together. The concept of Romanoff Elements evolved when a number of years ago, I merchandised several photography exhibits in a home store. I discovered that seeing how artwork compliments furniture and accessories in a retail shop is a great way to see proportion and scale, something that can be difficult to imagine. It is a relatable way to view fine art, for customers to see art that they like, and how it will translate and fit into their own space and decor. Our first exhibit was with Andrea Bonfils, a multi-dimensional artist. The merchandising team at Nest beautifully layers their furnishings and accessories. The art is incorporated into each vignette, just as they recommend customers do in their own homes. As Nest's clients began to express interest in art and making purchases, we began to offer in-home meetings, a complimentary service. Bets and myself will visit and meet with a customer in their home, and discuss what they are looking for in artwork. This is very personalized, depending upon the space, interior design, style and of course budget, we then provide recommendations of suitable and appropriate artwork. The pics in this post represent some of the artwork we've showcased in the store or in one of our clients homes. We are interested to guide customers to find artwork that suits their taste and lifestyle. 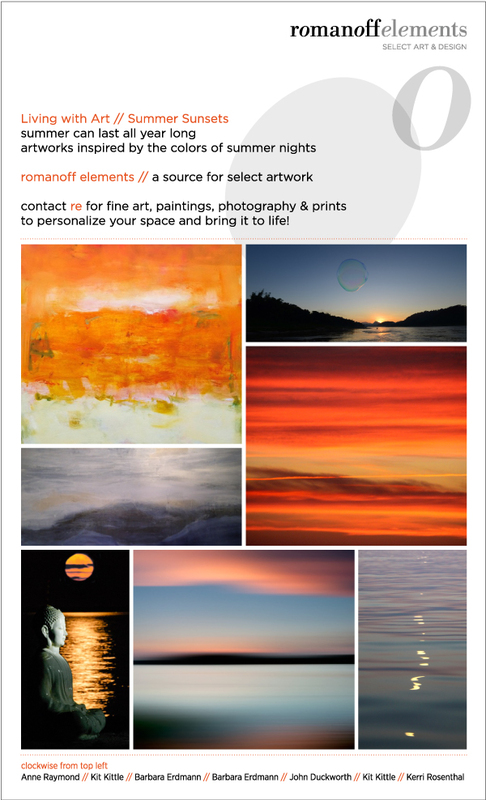 Romanoff Elements is continually seeking new artists and artisans, in all medium, paintings, prints, sculpture and mixed media, to fit the needs of our varied customers. The shop presents art along with their furnishings and accessories, in addition to custom orders, vintage finds, and in-store design assistance, this rounds out the full range of products they offer and sell to complete a home. They suggest you "Shop the Nest, whether you're working with a designer or love your own decor deals!" We're happy to join Nest this week, Thursday December 18th, they have extended hours for holiday shopping. We will be at the store from 5-7pm with a variety of artwork from different artists, discussing our art consulting service and we'll be scheduling in-home appointments for the new year. Another thought....have you considered The Gift of Art this season? Hope you can stop by and join us Thursday and look at some possibilities! Summer is a short season that has a big impact. From Memorial Day to Labor Day, the warm days are filled with fun, vacation, outdoor activities, spending time with friends and family. Especially in the Northeast, we wait a long time to enjoy the longer, sunny days. Soft colors and artwork can bring these warm feelings of the season indoors all year long. These artworks capture summer, from the subject, shells, seascapes, the beach to abstract interpretations of them. Color is a common thread when evoking summer, we associate soft sun-drenched colors with the warmest months. As I’ve written about before, the color blue is everyone’s favorite. There are many reasons, but when it’s soft, it feels like nature, like sky and water. I stopped in to John Duckworth's Johns Island, SC studio a few months ago with some friends while we were visiting nearby. John artfully captures the colors of the SC coast in his collection of Abstract Landscapes. According to color expert Kate Smith, of Sensational Color, "The color of ocean and sky, blue is perceived as a constant in our lives. As the collective color of the spirit, it invokes rest and can cause the body to produce chemicals that are calming". A client recently requested the “color of a summer sky” for an iconic Drippy Heart painting from Kerri Rosenthal. Here is Sea of Hearts installed in the traditional entry of her Westchester home. Kerri sent the color sample, on a late winter day with a note that felt hopeful for warmer weather, “the sky on a perfect summer day”! Blue and and it's compliment white, in its many variations, is classic summer. The many shades of white are captured in a fun graphic collection of sand, by photographer Barbara Erdmann. Wings is one of a few images in the series that captures it's movement and texture. Nature shows her color in the range of whites in Shelli Breidenbach’s Abstract Shell series. Shell No. 2 is one of six large-scale graphic images that show the incredible beauty of each shell form. to the quieter Sound Portrait #2 and it's mirrored image, mounted in acrylic. This diptych is 80"x40" overall and creates a strong statement for such subtle work. I have recently met photographer Kit Kittle and I'm enjoying showing his Bubble Collection to my clients and observing their smiling responses. Kittle takes his machine around the world and captures the reflection in the bubbles, "which is a thousandth of the thickness of human hair". The images reflect the color & light in the bubbles as well as the natural beauty surrounding them. To Kittle, "it is surprising that some things are just this simple". This image, Before the Fall was taken close to home off the LI Sound. The sun, warmth and colors of the summer season inspires artists, they want to capture it in their respective medium. Their artwork enables us to bring the soothing enveloping warm feelings of the season indoors…why not enjoy summer all year long? But first, enjoy it now! Color theory and studies provide a myriad of reasons why and how individuals respond differently to color. Color response is sensory, it’s literally the first thing we respond to, it can affect our moods, cause physiological reactions, and affect our decision-making. Artist Kerri Rosenthal has clearly made the decision to Choose Color! She wants her art to make people happy, and her use of color does just that. "I love that my paintings bring color into my client's homes - Although at times I paint in soft tonal hues, for the most part, my comfort zone is painting in color, and what I think it does to the homes they end up in- is take clients out of their comfort zone allowing them to bring bright happy colors into their home, they might normally not gravitate to". I have written about Kerri's artwork before, but seeing how the paintings look in various interiors, is about how the colors in art can contribute to a different and personal feel. "All of these homes embrace color, some more dramatically than others but there is a definite underlying common denominator… Happy Art = Happy Home…"
Kerri is influenced by various artists and periods, from the Impressionist type landscapes to the Pop Art-like Hearts and Flower Bomb Series. The Drippy Heart Series is pop-inspired, she uses flat planes of solid energetic color, in a large scale interpretation of an everyday object. Kerri creates a painting from this icon of love, with “drippy’s” spilling out of the giant heart, that make you smile. Sunny yellowor sky blue, the bold paintings look beautiful in these sophisticated interiors. Bright color, bold images lighten the mood, Kerri’s encourages people to have some fun in their rooms. I like this from Sensational Color, Smith's color advisory service , “Bright colors are the calling card of a joyful space”. Sensational Color advises its readers and clients to “create a mood that highlights your personality by using color…to build a fun and whimsical mood…Indulge in your inner Peter Pan or Alice in Wonderland…create a playful room—the kind you’ll love to live in". Be playful as Kerri's client did with her bold mix of unexpected color and pattern. Or rely on art to brighten a neutral space with color. Many choose to decorate their homes in quieter colors. This provides a great backdrop to accent a color you love in the art you select. The art becomes a focal point. It takes confidence to follow your instincts, decorate and buy art that’s filled with colors you love. Kerri has encouraged others to do that. It's been fun to watch clients respond to her work, usually with a smile!! The tulips are fun with a dozen…or just one! The Rye, NY store is filled with a variety of paintings, all artfully arranged in vignettes among their merchandise. Customers can easily create joyful spaces in their homes with art, furnishings and accessories from Nest. Color can create the mood you want in your home. The color in art can be a big part of that, by either being the main focus in a neutral room, as part of an overall color scheme or it can be part of the mix in a more exuberant and colorful space. Kerri Rosenthal chooses to create joyful artworks with her fun mix of color that can work to create any one of these moods. Choose Color… and enjoy it!